UnitedHosting Review 2019: Is UnitedHosting a Good Hosting? UnitedHosting has been providing rock-solid shared and dedicated hosting with 100% uptime SLA for the past ten years. The company has a world-class data center with full-time support staff on-site in the United Kingdom. 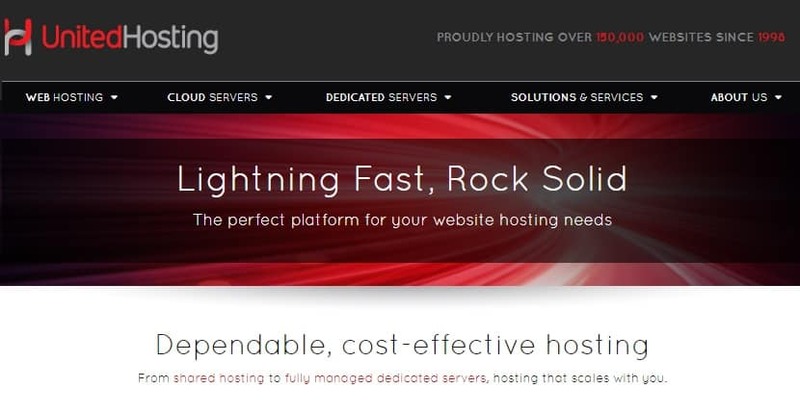 Founded in 1998, UnitedHosting is a U.K.-based hosting service that powers over 150,000 websites. It offers basic shared hosting plans, optimized VPS, cloud-based solutions, and dedicated servers. From September 2018 onwards, UnitedHosting started offering its shared hosting services through a sister company, Hosting UK. With a 99.999% uptime record, UnitedHosting’s shared and dedicated hosting services offer excellent reliability. This is in part thanks to high-grade servers from Dell and the company’s comprehensive monitoring services. On top of that, you’ll get daily off-site backups and high levels of support, so there’s no question about the security or performance here. One thing you’ll notice, however, is that the shared hosting packages here don’t offer much storage. For instance, the entry-level Bronze plan offers just 200MB disk space and 5GB traffic bandwidth. Even the highest-tier Platinum package only goes up to 2GB disk space and 20GB data transfer. This means that you won’t be able to host media-heavy websites on the shared hosting plans here. Signing up is easy. Your account becomes active the moment you place an order and pay. With every plan, you get access to a cPanel installation with a one-click installer that allows you to set up your blog or website using open-source CMSes, such as WordPress and Drupal among others. To top it off, UnitedHosting backs up your website files and emails several times a day. If you own mission-critical websites that require dedicated RAM, storage, and flawless uptime, then consider the high-performance dedicated servers here. Stable and secure, these servers are built on powerful hardware and include licensed software. You can choose between servers that run on Dual Intel Xeon E5 or Intel Xeon E3 processors. With your server, you also get extras such as MySQL DBs, unlimited mailboxes, and parked domains. When it comes to pricing, UnitedHosting matches its cost with a full suite of features. You don’t get a ton of resources with shared hosting, but at least you do get great perks like unlimited subdomains, MySQL databases, and dedicated IP addresses. UnitedHosting doesn’t have any hidden charges, though they do charge setup fees for dedicated servers. VAT is not included in the listed prices, so you may end up paying quite a bit more when you order a package. I like the fact that this company doesn’t entice customers with initial offers and then change prices later on (as is the case with many other hosting providers). While I don’t like the resource limits here, at least there’s a “no overselling” policy on shared servers. In the long run, this should give you better performance for your website. With a 15-minute average response time, UnitedHosting has one of the most responsive support teams I’ve seen. The company’s in-house technical team is available 24/7 via email, live chat, and telephone. 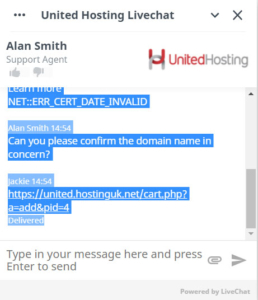 One caveat, however: when I tried to purchase shared hosting through UnitedHosting, I hit a security warning indicating that the company’s SSL certificate was expired. I contacted customer support about this. While the live chat agent picked up almost immediately, he merely told me to bypass the security warning and continue the purchase anyway. This is a huge cause for concern: if the company doesn’t keep its website’s security up-to-date, what about the servers its customers are hosted on? For this reason, I’d proceed with caution until — at bare minimum — the company renews its SSL certificate. Having been around for more than a decade, UnitedHosting understands its market very well. The company provides affordable shared hosting plans and scalable VPS infrastructure designed with performance and security in mind. Wondering how UnitedHosting stacks up against other Web Hosting companies? Enter any other Web Hosting company and we will give you a side-by-side comparison.